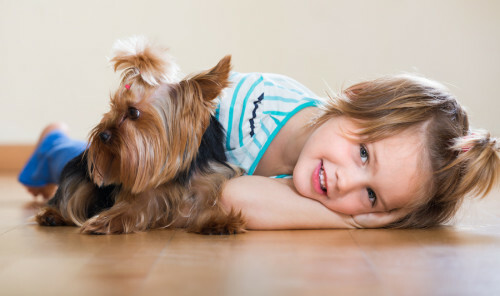 Selecting a flooring solution for your interior can appear to be difficult at first, due to the wide range of both the options available and the benefits provided, and this problem can be exacerbated somewhat for those who have either pets or children within their family. What pets and children have in common, especially young ones, is twofold. Firstly they are far more prone to produce mess than adults, which can not only create cleaning challenges with certain flooring types, but can also ruin them completely. Secondly, both of these are far more prone to hygienic issues resulting from certain flooring choices, a prime example being the potential for children to be crawling through dust mites and other unsavoury little characters, trapped in the pile of carpets. If your child tends to suffer at all from asthma-like conditions, this situation can be devastating on their health, both now and in the future. There is a simple flooring solution to such issues and challenges as above; and that’s to make oak flooring your flooring product of choice for your home. Let’s look at the benefits. Carpets are a breeding ground for dust mites, which feed off the dust, dirt and harmful toxins that are trapped in the twisted fibres of carpet. The fact that your floor may well be the home for millions of full stop sized creatures is perhaps disgusting enough, but this is not the end of the story. Dust mites are known be one of the main triggers of asthma attacks for individuals within the home, because 85% of asthma sufferers are acutely sensitive to the house dust mite. The problem is intensified by the fact that many believe there is no effective means for removing dust mites from carpets. Opinion is somewhat split here, some arguing that vacuuming the carpet three times a week is sufficient; the problem however with this argument is the fact that most people vacuum their carpet once every three weeks. Others argue that due to how imbedded the mites are within the carpet, especially deep pile ones, dust mites are actually impossible to remove through vacuuming, no matter how often it is done. The simple and obvious fact is that this problem does not exist with hardwood flooring because no such comfortable living and breeding environment is provided for the dust mites, and their other creature friends. Not only does it not provide the same optimum breeding ground, oak flooring is substantially easier to clean and keep clean, with far more effective results. It also requires no harmful cleaning products to achieve this, and does not attract similar substances from footfall. It has recently been demonstrated that artificial and harmful substances such as pesticides can all too easily be walked into carpets and become trapped. If this happens, it is obviously not something you want your young child, or pet, to come into contact with at all. Due to the fact that oak flooring is such a hard surface and so easy to keep clean, these potential problems are completely removed. Not only is oak flooring significantly easier to clean than carpet, you are also able to maintain substantially higher levels of ongoing cleanliness. Water (or Extreme variance in the Relative Humidity): This can cause your oak flooring to expand and change dimensionally with costly results. Grit and Similar Abrasive Materials: All wood flooring will mark and scratch over time, but this can be limited by implementing a good maintenance routine against the residual wear and tear it receives. There are a number of means by which your beautiful oak flooring can be protected from scratches, but even before they are applied, it is vital that your oak flooring is protected sufficiently by a suitable finishing product. Then, the cleaning off of such abrasive materials that can create scratches is far more simple. Unsuitable Cleaning Products: Some such products often contain harsh chemicals that can both strip the wood of its natural elements, whilst also destroying the protective finish. Instead, you should use a pH-neutral cleaning solution that is specifically designed for cleaning oak flooring, and more importantly, oak flooring with the finish that you have. Now let’s explore the best practices for cleaning your oak flooring, which will not only help you to protect and preserve your oak flooring, it will also demonstrate the ease with which complete cleanliness can be accomplished. In order to limit the build-up of both dirt and grit on your oak flooring, you should either sweep or vacuum the flooring surface on a regular basis. With either method though, always make sure that you do not ‘push’ the grit along the surface of the floor with any force because this can cause scratches. In order to avoid scratching the oak flooring when using your vacuum cleaner, select either a brush setting or fit a soft bristle to the nozzle. Complete a thorough clean of the oak floor surface once a week with a suitable and appropriate specialist floor cleaner. This should only be done after it has been vacuumed in order to prevent grit from being rubbed over the surface as mentioned above. If cleaning the floor using a mop, make sure you do so in conjunction with a pH-neutral water based cleaning product, and make sure that the mop is no more than damp. Should any marks still be apparent, like shoe polish etc., clean these off with a specialist spot cleaner, making sure not to ‘scrub’ the area so hard that it appears differently to the surrounding floor area. That’s how simple it is to keep your oak floor absolutely spotlessly clean, both from an aesthetic and a hygienic perspective. To reach anywhere near the same cleanliness with a carpet, it would require regular steaming and vacuuming of the whole surface, at least three times a week. Unlike with carpets… dust, dirt, mites, insects and grime cannot become caught or trapped in oak flooring, or worse still make their own comfortable breeding home within it. This is because of the hard surface area it creates when installed, removing any opportunity for such things to do so. Due to this, a dramatically increased level of air quality is achieved when oak flooring is installed in the home, which is perfect for preventing your young children or pets from contracting respiratory illnesses. Now that you have seen the benefits that oak flooring can provide for you as the parent of a child or the owner of a pet, you will no doubt want to take advantage. Choosing oak flooring over carpet does not mean that you are making a compromise on the aesthetics of your interior or on its practicality; in fact you are probably improving both. Our product range contains a diverse selection of different colours, tones, shades and types… enabling you to select the optimum oak flooring solution for your interior, with regards appearance, efficiency and practicality. With these considerations in mind, we also offer a number of oak floor solutions that provide an auxiliary practical function such as our ThruFlow range which provides enhanced levels of compatibility and efficiency when used in conjunction with underfloor heating (UFH). For further information about the benefits that oak flooring can provide for your home, or to enquire about our product range, a member of our dedicated customer service team can be contacted by calling: 0800 043 3073. Email enquires can be sent to us at: sales@oakfloorsonline.co.uk.